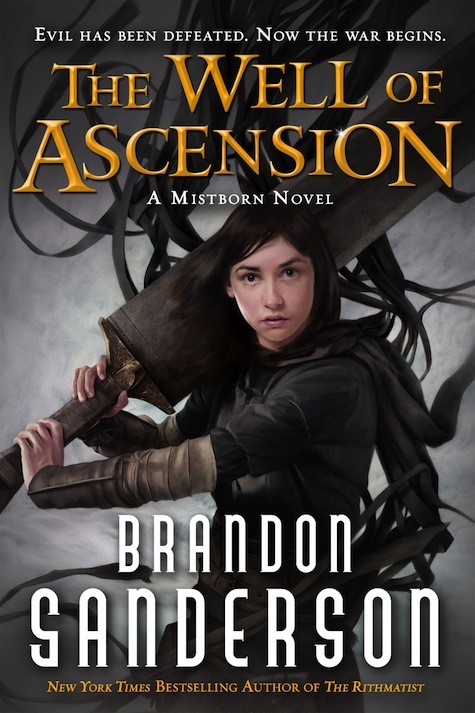 #1 New York Times bestselling author Brandon Sanderson's epic Mistborn Trilogy continues with The Well of Ascension. They did the impossible, deposing the godlike being whose brutal rule had lasted a thousand years. Now Vin, the street urchin who has grown into the most powerful Mistborn in the land, and Elend Venture, the idealistic young nobleman who loves her, must build a healthy new society in the ashes of an empire. They have barely begun when three separate armies attack. As the siege tightens, an ancient legend seems to offer a glimmer of hope. But even if it really exists, no one knows where to find the Well of Ascension or what manner of power it bestows. It may just be that killing the Lord Ruler was the easy part. Surviving the aftermath of his fall is going to be the real challenge. I gave this book 5 stars. It was such an amazing sequel. Honestly, I didn't think it was going to live up to the first book, but it more than did. There were so many twists and turns I didn't expect and I just had a great time reading it. So, new book, new characters. I have to say, that I actually really liked Zane. Zane was pretty crazy, or so I thought, but he was "my type". I really wanted him to stay away from my ship though, he spent almost the entire book trying to break them up and that pissed me off. What I liked about his character was that it felt like Brandon was trying to sort of poke fun at average stereotypical YA romances. There is a guy who is really broody and angsty who the main character is supposed to "save" as Zane kept repeating throughout the book. Now I don't know if the author actually meant it this way, I'm not your English teacher, I'm not trying to interpret things that aren't actually there. I am really interested to know who "God" was. Cause just as Zane was dying "God" told him that he wasn't actually crazy, so who is he? I also came to love Oreseur, or should I say OneSoon. The whole plot point with him was not what I was expecting at all. He grew on me as a character, but when it was revealed who he truly was, I have to say I was completely shocked. He was the second Kandra that was hidden in there midst. He was the one who had been spying on them so well. I love it when things happen that I don't expect. I feel like I should wait to talk about this, but it's at the forefront of my mind right now and I need to get it out. So I read the last page before the Epilogue, first. I thought I had spoiled so much and i had just ruined the entire surprise for myself, but then when I finally got there, I realized I hadn't even scratched the surface of spoilers. I'm itching to get to the next book so that i can find out what they accidentally released from the Well of Ascension, was it "God" who was talking to Zane? What's going on here? 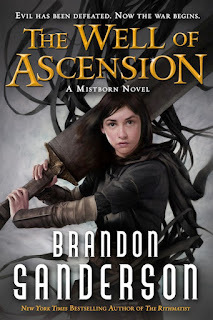 Also, what's going to happen with Elend and him being a Mistborn. What are they going to do? Speaking of Vin and Elend, I was a bit upset for about the first half of the book because they honestly felt like they were drifting apart, and then Zane came in with his idea for him and Vin to leave together and I was done. I was terrified that she was actually going to do it. Thankfully she didn't. But what happened next just made the whole suffering the first half so much better. Her and Elend finally got married. I was feeling so petty when Penrod got voted in. I was honestly so mad that I had to put the book down and do something else until I calmed down. I actually wrote down my feelings after this and I wrote down "I hope Penrod has a pen stuck up his rod" because I thought that he was actually going to get around to giving the city to Straff. When I am angry I am honestly so petty. Even with fictional characters. I feel like the characters have just come so far in this book. Vin has just totally blossomed. She started in book one, but in this book, she was so insecure about everything from who she was to whether or not she was worthy of Elend. She just figured most of it out and I was really happy for her. Then there was that whole thing with Sazed and Tindwyl. Things were going so well and they were just so cute witht heir nerd love! Sitting around studying all the time trying to figure the whole Well of Ascension and Hero of Ages thing out. Tindwyl may not have been my favourite character, but I was definitely sad that she had to die. She was so good for Sazed and after the life she's lived she deserved to be happy for once. I need to get to the next book, probably not this month since I think I need a contemporary break, but soon. I feel the overwhelming need to clarify about my blog name because I know that the first definition of this word is usually about projectiles in flight. No I am not doing rocket science with my books. Jessie has read 81 books toward her goal of 200 books. My name's Jessie. I love to read, a lot. Since I don't have many people to talk to books about I started a blog. I would have made a booktube channel, but my crippling anxiety keeps me from doing that. I feel much safer writing reviews from behind my keyboard like any other internet troll. With slightly less trolling. Anyway, I hope you enjoy reading some of my thoughts and feelings on books I read!